You, Sir, are an Aquamancer. Also MEGA thanks to Ben Chandler for the tangents suggestion on twitter, bottom left is improved now! It’s kind of tradition in adventure development, and games in general, to wildly misjudge how long it will take to finish a game. As a rule, take the number given by the dev, halve it, then add 9 years. Cool..I not trying to be pushy , i was just wondering , now I know not to get hopes up to soon. I don't want to defend myself or the project. But as Stu mentioned games release dates are estimated based on plans that are made under specific circumstances. I don't recall giving an exact release date estimation and if I did I apologize for not delivering. Tardigrades is not the first project that takes as many years, for instance Space Venture by the Two Guys from Andromeda started around 2013 and still not released. I know several indie devs from different genres going through the same issue. The moment I started this project life surprised me with stresses challenging me between family care, a full-time job, plagiarism and threats, until a couple of weeks ago of which I had an appendectomy. I can assure you that no day have passed that I did not open a software for Tardigrades. Except during my time in the ward after the appendectomy was performed. I even had my sketch book where I drew the background above along with 3 more. This water animation is awesome anas! This screenshot is stunning, as are all from this game. Great work, and thanks for sharing. Also, you've gone through a lot to bring this to us. I'm glad to see that you are persevering, and look forward to the eventual release, even if it takes many more years. This game looks so promising. The water looks simply gorgeous! Will you be able to toss in a coin and make a wish? Wow, really cool how the spots of sun through the laves reflects on him, impressive! Though I'll admit it took me a second to see that and realize there wasn't white mice crawling over him! Thanks! I like the idea of white mice crawling though, right Tabby? Wow, that is one cool sci-fi Egyptian temple! Have you thought about posting any more time-lapse videos on how you make all fantastic scenery? 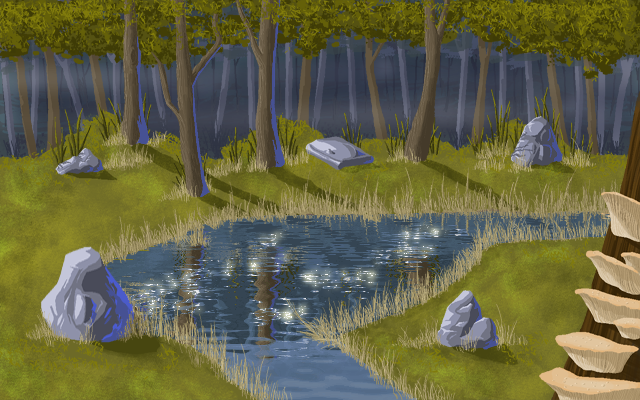 Many of those backgrounds are not finished in one setting..